4 weeks until the big day comes. Landon is off to kindergarten and with that, a loss of homemade warm lunches each day. We’ve gotten lucky to have such a great daycare arrangement for 5 years. He gets 2 healthy snacks and lunch each day. They’ve expanded his palate (turkey curry!). They’ve found his new loves and dislikes. We are going to miss it, for sure. So I made the decision to pack Landon’s lunch. 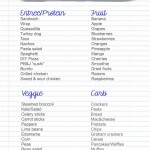 I know he eats healthy options and I plan to keep that up as much as I can. If he starts to ask to buy lunch, we will reassess but right now this is the plan. I thought about this for a good while. After Laura wrote this post for me years ago, I have been conscious of excess waste and how I wanted to avoid that. So I asked around and looked and ultimately pulled the trigger one day when I got a Pottery Barn kids sale email. I went with their bento box option that fits perfectly into his new Darth Vader lunch box (which he earned for having an AMAZING week a daycare one week). So far it has worked really well. Yes, the price gut punches you but I waited for a deal email and also realized how much I save in sandwich bags. 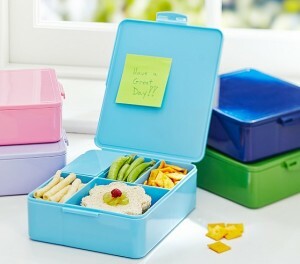 It is dishwasher safe and really keeps all the compartments separated. Some more veteran moms say that by about 4th grade or so, their kids needed more food but for Landon, I find the sections very deep and plenty for him. Some worry about the clasp being too hard for him to open but I had him try and he did just fine…but I think he has been asking his teachers to do it. I need to work on this more but I know he CAN. It is hard to see in the photos but they are really solid. There is nothing flimsy. I can imagine maybe the first thing to give would be the hinge of the little door section but hard to tell since it isn’t like you are opening and close it constantly. Big plus? Dishwasher safe. Sits right in our top shelf. and yes, we basically run the dishwasher daily in this piece. 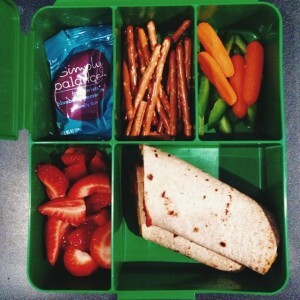 To practice a bit, I have been packing his lunch one day a week for a few weeks now (I am still paying for food at school so I ain’t dumb). 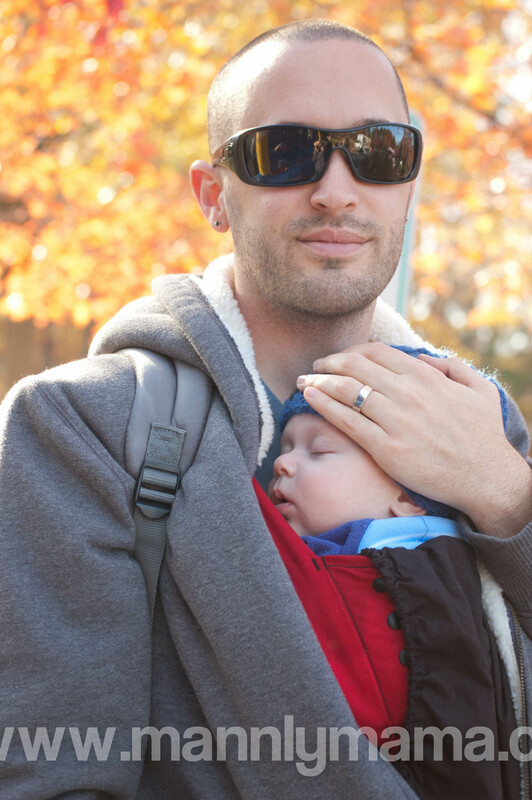 This has given me a chance to see how easy/hard it is to throw it together in the normal routine, what are some fun options he likes and just get us in a little bit of a habit. 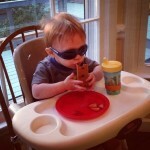 This has also helped gauge how much he will eat of what I send. His teachers have let me know how much is left (very little). He also likes bragging. Joy. My best timing is throwing together stuff is while I am making dinner. Like when something is steaming in the microwave, I can make a wrap and cut up veggies. I’ve only done it once where I have to do it in the AM and it wasn’t terrible either. My goal is easy foods. 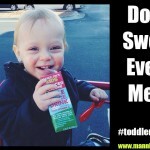 I’m lucky that my kid like raw veggies and fruit, so it helps a lot there. Also I am still queen of leftovers. 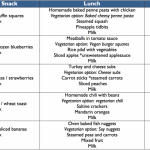 So here is a few options we have tried out over the weeks. I can say they were pretty easy to whip up. 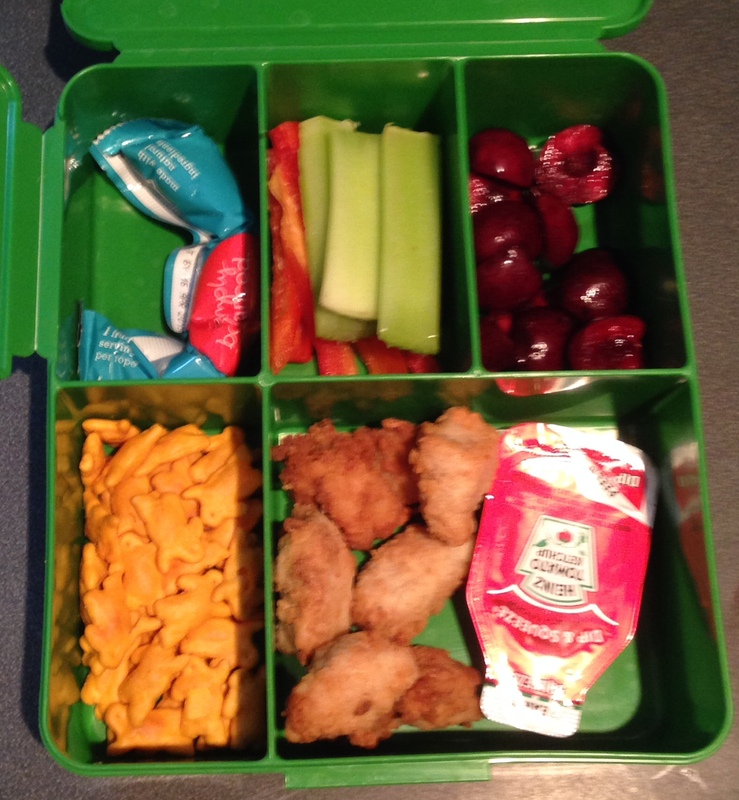 Chick fila nuggets (leftover from Ollie’s birthday), cheddar bunnies, cherries, red peppers, celery and a fruit leather stick for treat. Pizza wrap (pepperoni, cheese, peppers), pretzels, carrots, green peppers, strawberries and fruit snacks for treat. 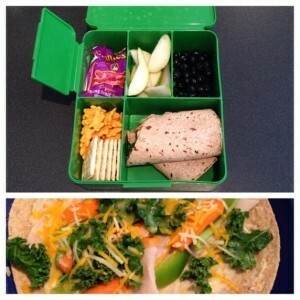 Turkey, kale, carrot, pepper and cheese wrap with hummus, saltines(he loves), cheddar bunnies, blueberries, pears and fruit snacks for treat. 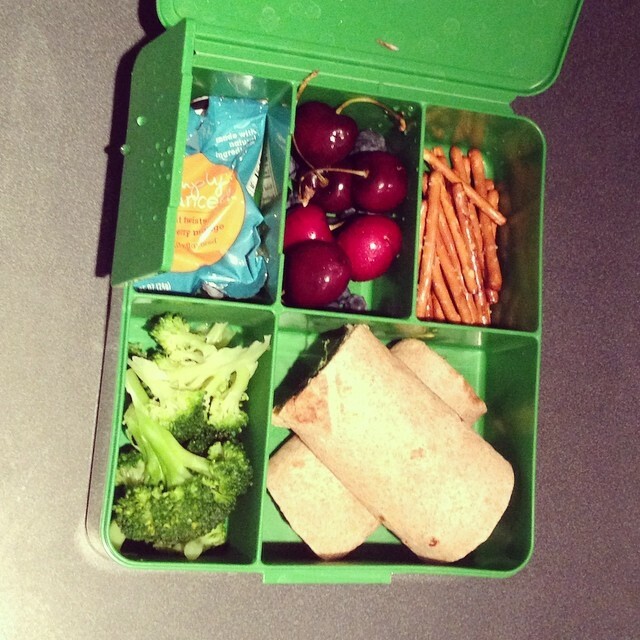 Turkey, cheese and kale wrap, steamed broccoli, blueberries, cherries, pretzels and fruit snacks for treat. So what are you serving up that is a hit and quick? Anymore questions? Okay, first of all I am still in awe of what Landon will eat. We are not going to kindergarten until next year and I just leanred I don’t have to pack his lunch. However, I do have to pack a snack and it can only be a fruit or a veggie. So, I am wondering what you think I should put it in for waste purposes and if you have any creative ideas. I am so worried he will be hungry but don’t want to just send an apple every day. Also, where in the world did you get the cute ketchup packet? 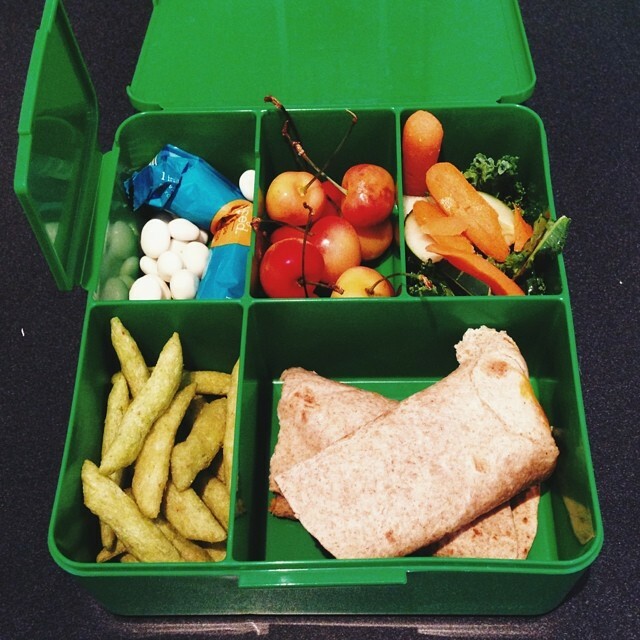 I am in love with that Spencer bento box. My guy prefers to eat his stuff (mostly) separated so thank goodness for a one piece that I won’t have to worry about separate pieces getting tossed in the trash at school. 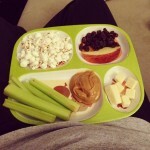 I found a website the other day where a lady packs her kid’s lunches daily and photographs them. 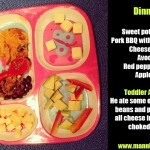 They are bento style and she sometimes gets cutesy with them using different food picks or cutters. I won’t be doing that daily, but maybe every now and again. She does have a gallery that I went thru with Tristan and let him tell me what kinds of things he would like to have for lunches. Because, while I do know what he likes to eat, sometimes I get stuck in a rut. So I made a list. And luckily for me, the only cutesy thing he asked for were star shaped strawberries. I can do that on occasion. Wendolina is the blog if you wanted to take a look at it. We’ve been through some pricey storage containers BUT because the staff/teachers typically have the littles clear their own area, dumping their own trash and in the process we’ve lost some good stuff. I know it is in the spirit of building independence but once you lose some good stuff, you move on to the cheaper versions. We’ve used the Rubbermaid bento containers, with the green lids. Still dishwasher safe and we’ve still lost some but I have Mabel’s Labels on all of them and we have keep most of them.